2. All cats must have collars removed while being boarded. 3. All cats will be checked for fleas, ear mites, ringworm, any other parasites or contagious conditions. Cats found with such conditions will be subject to forfeiting their reservation and be ask to board elsewhere for the safety of the other kitty boarders. 4. 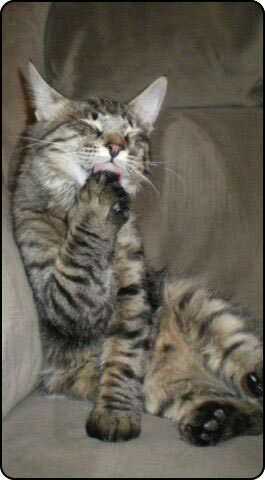 All cats must be flea free and disease free and current with an approved flea control product. We offer Capstar for a very reasonable fee upon admission to our facility which is only a "quick fix" for fleas that are currently on the kitties. 5. All cats with a history of biting must have a current Rabies vaccine. 6. All cats must arrive and leave our facility in a carrier. NO EXCEPTIONS. 7. We require your preferred veterinarians name and phone number to be on file while boarding. If you do not currently have a preferred veterinarian, we can provide you with names of local veterinarians we have worked with. However, it is your responsibility to choose a veterinarian you feel confident with and trust. 8. We do encourage you to bring your kitty's favorite toy, treats or bed to make your kitty's stay as comfortable as possible. While infrequent, please be aware these articles may become lost or damaged at times. 9. We also require that you bring your cats food from home as this is a much healthier transition during there stay, changing their food may cause them digestive problems and cause them to get sick with diarrhea. Cats that are on a Veterinarian prescription diet, it is mandatory to bring in their food. We do however keep a stock of premium food on hand that will be charge for accordingly. Kittyland Resort takes great pride in trying to provide you with the cleanest and healthiest boarding facility. However, no boarding kennel is 100% safe from Feline Upper Respiratory Infection, including us. You do take a risk every time you board your cat and there are no guarantees against F.U.R.I. We exercise great care to keep our facility clean, sanitary and properly enclosed. We check each and every cat for visible signs of fleas and disease. Q: What is feline upper respiratory infection? A: Feline upper respiratory infection (URI) is a highly contagious disease affecting the nasal passages and sinuses of cats and kittens. A: Feline URI is transferred between cats by fluid discharged from the mouths and noses of infected cats. Cats shed the virus through the air by sneezing, coughing, or breathing; or by direct physical contact with cages, toys and food bowls. Q: What are the signs? A: Symptoms of feline URI include sneezing; fever; runny nose or red, watery eyes; nasal congestion; and ulcers on the tongue, gums, lips, nose, or roof of mouth. Symptoms are generally mild at first and worsen within one to three days. The incubation period (the time period between infection and the first signs of illness) lasts from 2 to 17 days. The illness typically lasts from one to four weeks. Q: Which cats get it? A: Any cat who is stressed by poor nutrition, cold or heat, age, or fear. Cats who are especially at risk for infection include unvaccinated cats, kittens (because they have immature immune systems), and cats whose immune systems are compromised by another disease, such as feline leukemia (FeLV), feline immunodeficiency virus (FIV), cancer, malnutrition, or parasites. Q: How is feline URI treated? A: Feline URI is easily treatable even though there are no drugs available to kill the feline URI viruses. Treatment of feline URI is aimed at strengthening the cat’s body and immune system to help the animal fight the virus, and usually consist of vitamins, good nutrition, and good nursing care. Infected cats may stop eating or drinking, and may require special therapy to combat dehydration and malnutrition. The disease can lead to fatal pneumonia if medical care is not provided. A few cats may have chronic (long-lasting) symptoms and some symptoms may recur whenever the cat is stressed or ill.
Q: How is feline URI prevented? We do not accept cats that are FIP (Infectious Peritonitis) positive. Nor can we take cats currently being treated for ringworm. Ringworm is a highly contagious condition and all medication prescribed must be completed 1 week prior to your cat's stay. Please note Kittyland Reosrt reserves the right to refuse services based on any pets' temperament or health.